After extending the downtrend early in the session, stocks showed a substantial turnaround over the course of the trading day yesterday. The Dow Jones bounced off the lows of the day closing firmly into positive territory. The rebound came after a report from the Financial Times said the US and China have intensified efforts to reach a trade agreement at the G20 summit later this month. Traders were also digesting an avalanche of data. Today, however, the economic calendar is relatively quiet, although traders are likely to keep an eye on the Federal Reserve's report on industrial production in October. 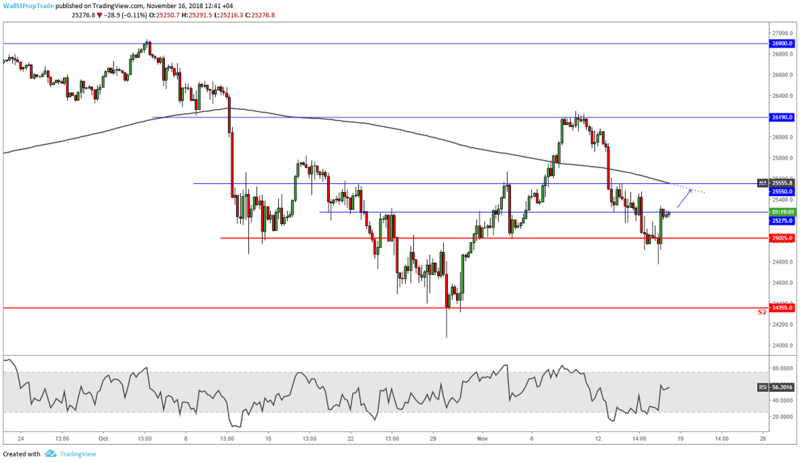 After trading down to 24,900 earlier in the session, the DJIA surged back up over 300 points from the lows closing firmly into positive territory and forming a bullish engulfing candle on the hourly chart. The index is now back above the moving averages, and a strong upward momentum extending to today's session might push prices higher. The RSI looks bullish on the H4 chart signaling short to medium term buying interest.